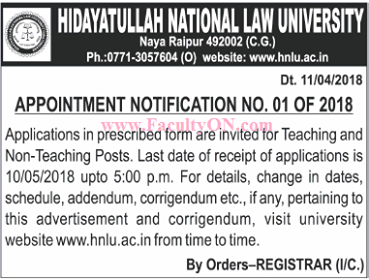 Hidayatullah National Law University, Naya Raipur has advertised in THE TIMES OF INDIA Newspaper for the recruitment of Associate Professor/Assistant Professor/Professor job vacancies. Interested and eligible job aspirants are requested to apply with in 10th May 2018. Check out further more details below. About College: HNLU is a Residential University and is sixth in the series of National Law Schools in India. HNLU has been included in the list of the Universities maintained by the University Grants Commission under Section 2(f) of the UGC Act, 1956 and has been declared fit to receive Central assistance in terms of the rules framed under Section 12 (B) of the UGC Act, 1956. The university is recognized by the Bar Council of India under section 7 of the Advocates Act. Hon'ble Mr. Justice Arun Mishra, Judge, Supreme Court of India is the Visitor, Hon'ble Mr. Justice T. B. Radhakrishnan, Chief Justice, High Court of Chhattisgarh is the Chancellor and Prof. (Dr.) Sukh Pal Singh is the Vice-Chancellor of the University.